Germaine Greer is an Australian feminist, transphobic, writer. She delivered the Haydn Ellis Distinguished Lecture, called 'Women and Power: The Lessons of the 20th Century', at Cardiff University. Asked who she admired as a feminist, Greer dismissed Emma Watson who she dislikes (along with Harry Potter), and picked the head of the IMF Christine Lagarde, praising her for looking fantastic and going to the gym every day. Ms Greer said that the Harry Potter star was the classic example of a "bad book giving birth to a bad idea." 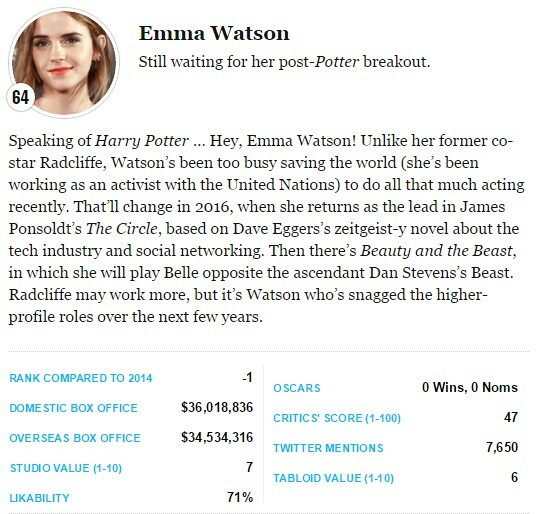 Emma is Vulture's 64th "Most Valuable Star of 2015"
Many factors determine a movie star’s value — including box-office numbers, social-media buzz, increasing foreign strength, and critical respect — and fortunes can change drastically in a matter of months if a star’s passion project flops or a new ingenue takes the world by storm. With all that in mind, Vulture has collected data (including domestic and foreign box-office numbers, critical love, social-media chatter, Twitter mentions, Oscar success, and likability ratings, according to E-Score Celebrity rankings by E-Poll) in every important metric that measures modern movie-stardom, inputting those numbers into a formula crafted with our guest statistician, FiveThirtyEight's Harry Enten, to determine 2015’s 100 Most Valuable Stars.